Believe it or not, Israel has a prophecy for oil … in the last days! And, not just one prophecy, but an impressive amount of prophecy. Wally takes you through the ancient prophecies and efforts in recent years to uncover that oil which is destined to shake up the entire region of oil producers. It is happening today, and you will be fascinated to hear how up-to-date ancient Bible prophecies really are. 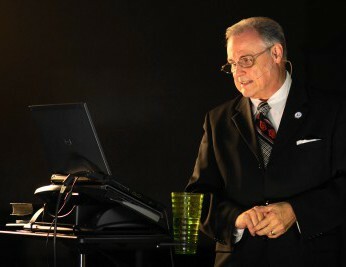 In May 2015, Wally was invited to speak before a Christian business breakfast group on one of his more popular messages — “Is America in Bible Prophecy?” — to one of his multimedia presentations. Taken from his research into the prophecy of Isaiah 18, he established very well the notion that, indeed, the United States is singled out as a mystery nation in the end-times … a nation of great prominence and power, only to be strongly disciplined by the Lord for its ultimate redemption! America needs this message!